Shrinking revenues and sliding market share has forced Mozilla to include display advertisements in its popular web browser Firefox. Darren Herman, Vice President of Content Services at Mozilla announced via a blog post few days back that they are considering placing advertisements within their browser to boost revenues. When you open a new tab in Firefox, you are shown 9 boxes, which are called Tiles. These tiles display the screenshot of the frequently visited websites, with a link to them. Internally, Firefox runs a ‘frequency algorithm’ which analyzes that user’s browsing history and accordingly displays the recommended websites in these tiles. Once this new advertisement policy comes into place, these tiles will display sponsored websites as well, which would be clearly marked as “Sponsored” just like Google advertisements. If the user is new, and has no previous browsing history, then Firefox will pre-populate these tiles with the most relevant website link it considers best for the user, based on a propitiatory algorithm. This new arrangement has been called as Directory Tiles, and the sponsored stories would be included in these recommendations. Mozilla has clarified that the sponsored tiles would be clearly mentioned and marked to remove any doubts. The placements within this new Directory Tiles (which would also be sponsored) would be based on the present geographical location of the user, the most popular content within the Mozilla ecosystem and other factors. This might be a first try for monetization as until now, Mozilla has refused any offer of advertisements on their browser, and this new decision may start a new trend in in-house advertisements for web browsers. Firefox has around 450 million users all over the world, commanding 18-23% of the market share, making them the third biggest web browser in the world after Chrome and Internet Explorer. In the last few years, Chrome has gained considerable amount of market share from Mozilla, which has resulted in lesser revenues. 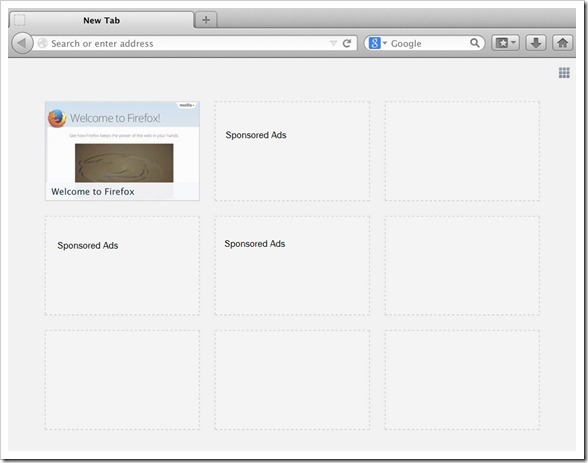 The primary source of monetization of Firefox as of now, is Google ads. 90% of revenues generated by Mozilla comes from Google as they have signed an agreement making Google their default search engine. They have partnerships for displaying Google advertisements on the browser. This new revenue model of displaying sponsored websites on it’s new tab window will surely attract criticism from the lovers of ad-free web, and from those who have already opted for “Do not track” feature. Talks are still on with some of the biggest advertisers, to clearly chalk out a feasible plan of showing advertisements. Will it negatively impact their positioning? Or users would be ok with it? Do share your views regarding this decision by Mozilla to show advertisements on their browser. Larger Smartphone Batteries: The New Marketing Mantra?